Don’t get discouraged when you think of cutting back on your food intake. Quick tips will help you begin reducing calories. Start with one, or more changes. Small changes add up. So get going! Aim for consuming 100 to 200 fewer calories daily. Give up your evening dessert. Cut down on cookies, or eliminate them. Skip the banana. 100 calories. Say no to a milkshake. Around 320 calories. Everyday cut out two pieces of bread. That’s about 260 calories. Replace soda with water, or chilled herbal tea. Regular 12 oz. soda 140 calories, 16 oz. 187. 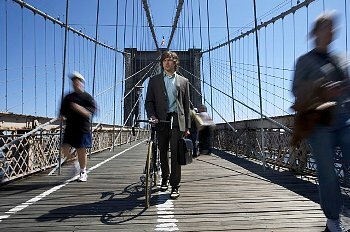 Drive less, walk more. You’ll also save money on gasoline. Park your car at the end of the parking lot, and take a round-trip brisk walk to the mall. Walk up stairs instead of using an elevator, or escalator. My grandma’s sister was a fashion maven, who admitted that she disfigured her feet by wearing high heels. When I was old enough to notice, I asked her why her feet came to a point, her big toe lay on top of her second toe, and why she walked funny. She said her feet were messed up and ugly, from squeezing them into tight fitting high heels. She made me promise I wouldn’t wear bad shoes, unless I wanted my feet to look just like hers. Fashion heels don’t have much to do with common sense. Steve Martin’s, “The Cruel Shoes,” is the story of Anna, who visits a shoe store, and gladly buys a pair of foot nightmares, that make her feet bleed. The premise isn’t really exaggerated. Most women buy heels based on emotional appeal, rather than foot health. While it may not overcome the powerful effects of advertising, WebMD, has a slide show to educate women. It’s called, “The Worst Shoes For Your Feet.” Incase you’re considering reconstructing your shoe wardrobe, here’s some inspiration to help you downsize the height of your heels. While I’m at it, I may as well comment on the Armadillo Shoe, because things like this have a way of influencing street wear. 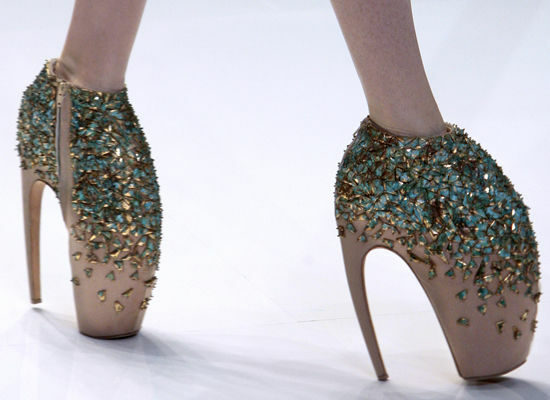 The late fashion designer, Alexander McQueen, came up with a risky 10 inch runway shoe, called the Armadillo. Some models refused to wear them. The phrase, “to die for”, would be apt, when wearing shoes like this, or a facsimile. Toppling over, and hitting your head isn’t too far fetched. Fanciful shoes are the realm of art, rather than practical footwear. Be kind to your feet. They affect the way you walk, and feel. Fashion shoes are beautiful in the box, but aren’t doing your two feet any favors. Corns, bunions, hammertoes, and ingrown toe nails aren’t lovely to look at. Healthy feet won’t embarrass you, when removing your shoes. You’ll never have to apologize for your corns.